A page of 'Things' to see and do, Sports and Pastimes. Whilst I've tried to keep the contents of this section as close as possible to Luz, some of these places listed are a bit of a drive (I've marked them with a * 15-30 minutes or ** within 30-45 minutes). ● Any of place names in light blue are links to their own web sites. ● Any prices I've shown are as a guide only, check before booking. ● Check your map before you start out. ( Click here for map ) or use the map below. ● I suggest telephoning during the peak season to avoid disappointment. ● Don't forget that if you phone using your own mobile you will need the 351 prefix to any of the numbers below. If you are a proprietor and wish to add or amend any detail, let me know by clicking on the link below. Click on the index name ( e.g. A: Albufeira ) to show the location on the map and display links to activities for that area. Moto X, Paintball, Jet Skiing, Water skiing. Multi sports. Moto Cross / Scrambling in the Monchique mountains. Sea fun, Paintballing. Tel: (+351) 282 457 263. Fax: (+351) 282 457 263. Archery Parque da Floresta Golf & Leisure resort. Tel: (+351) 282 690 000. This company features several times on these pages as it seems to be the only (established) one that caters for the slightly diverse sports and past times in the (western) Algarve. See also Mountain Biking and Climbing categories. Tel: (+351) 282 913 204. Fax: (+351) 282 911 405. Mobile: (+351) 965 004 337. This is the nearest to Luz, about 45 minutes drive. Open in the afternoon, the Casino has modern slot machines and table games - Roulette (American and French) and Blackjack. In the evening, there is also the Aladino Restaurant with its international shows and live musical entertainment. Casinos will charge an entrance fee. Foreign visitors must produce their passport. Men are usually required to wear jackets and ties. I've seen discount vouchers for here being given out in the street (Alvor) and in hotel / resort receptions. Where: Located at Praia da Rocha just by Portimao. Praia da Rocha, 8500-802 Portimão. Villamoura, Espinho and Monte Gordo. They offer staged entertainment as well as gaming rooms. The nearest (of this group) to Luz is the casino at Vilamoura, which is about an hour+ drive from Luz. Nightly show, Dancing, The Restaurant has full and tourist menus. Open: from 17:00 - 03:00. Tel: (+351) 289 310 000. Fax: (+351) 289 310 099. Where: Sitio das Relvinhas, Apartado 122, 8550-909 Monchique. Tel: (+351) 282 761 720. Guaranteed to see Dolphins or a free trip. Using semi rigid inflatables (can be quite bone shaking), you travel out for a 90 minute run with the dolphins. Tel: (+351) 282 087 587. Football * Faro - The fairly new (Oct 2003) 30,000 seater Estádio Algarve is home to both first division club SC Farense and Loulé's Louletano. Built for Euro 2004, it is now no longer overly used. Where: The new stadium is located in São João da Venda, midway between Faro and Loulé, and is part of the new Parque das Cidades development, which includes a botanical garden, landscaped spaces, a lake and a nine-hole golf course. Ask in any bar in Luz for the weeks matches (if any). You'll see it on the way out from Faro Airport. Then nearest 'decent' team is Portimonense in Portimao who play in the Liga da Honra (roughly the equivalent to the Championship in England i.e. the level below the Superliga / Premiership.) The nearest Superliga teams are way up in Lisbon i.e. Benfica, Sporting etc but as all their games are live on TV they are always in the evenings so you can easily watch them at most 'local' bars. Directions (Faro): The stadium is located 8km north-west of Faro on the road to Loulé. Using the railway from Faro (to Lisbon), there is a stop at Parque das Cidades. Portimao - Nearer Luz is the ground at Portimao, which is a local pitch in the middle of the town. Matches are more regularly played here. Ask in any bar in Luz for the weeks fixtures. More than 200 varieties of fish are to be found in Portuguese waters. Even from the beach there is a good chance of landing sole, plaice, bream or bass. 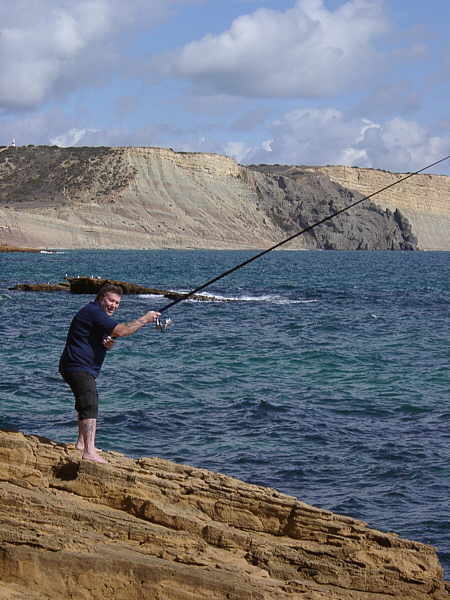 There is also good fishing from the extensive rocks or cliffs adjoining the beach at Luz. At greater depths skate, mackerel and tuna can be caught. Lagos, Vilamoura and Portimao are the centres of big game fishing, where you can join regular organized trips. The nearest proper' tackle shop I've found (so far) is in the old town part of Lagos, cheaper 'holiday' kit can be purchased at Intermarche superstore, Lagos. Catch and Release Big Game fishing out of Lagos marina. Marlin, Shark & bottom fishing. 33ft sport fishing boat. Where: Full details and pricing at Marina de Lagos. Tel Mobile: (+351) 966 193 431. Fax: (+351) 282 789 272. Complete fishing trips from Lagos harbour, including coastal trips, snorkelling and big game fishing. Information provided daily from 8am to 7pm at the number below. Tel: (+351) 282 761 820. Tel Mobile: (+351) 966 003 147. Fax: (+351) 282 415 136. Where: Apartado 1308, 8125 - 000 - Quarteira - Loulé. Tel: (+351) 289 313 939. Fax: (+351) 289 313 160. Tel: (+351) 282 997 300. Lagos Aerodrome offers plane and microlight flights, aviation courses and lessons. Tel: (+351) 282 762 906. Fax & Answerphone: (+351) 282 762 906. Sightseeing flights from £65.00 for up to three people. Plane rental, Workshops. Golf See the separate Golf page for details. the circuit is a replica of the Jacarepagua Formula 1 circuit in Brazil. 160cc / 200cc / 400cc models available. Tel: (+351) 289 399 899. A self-contained holiday centre with gym, 5 tennis courts and 3 swimming pools. Where: Ocean Club (Luz Bay) Praia da Luz. Tel: (+351) 282 789 764. Where: Vale Grifo, 1677-E Almádena, 8600-102 Luz de Lagos. Tel: (+351) 282 697 395. Fax: (+351) 282 697 395. Where: Bensafrim, 8600 - Lagos. Tel: (+351) 282 687 263 / (+351) 282 687 596 / (+351) 282 789 801. Fax: (+351) 282 687 507 / (+351) 282 788 307. Where: Apartado 43, 8501-903 - Mexilhoeira Grande. Fax: (+351) 282 471 304. Tel Mobile: (+351) 966 619 136. Where: P- 8600-080 - Bensafrim, Lagos. Tel / Fax: (+351) 282 687 502. Tel: (+351) 282 968 444. Fax: (+351) 282 968 443. Tel: (+351) 289 395 529. Tel Mobile: (+351) 917 976 995. Tel: (+351) 282 973 184. Tel Mobile: (+351) 967 059 551. Tel Mobile: (+351) 967 095 937. Explore the Algarve interior from the back of an open topped 4WD. Various trips. Be prepared for a bumpy ride! Tel: (+351) 289 583 300. Where: On the right hand side on the N125 going toward Sagres. Tel: (+351) 913 372 332 or 967 460 989 to find out wether Blokart Sagres is open before you travel. Lawn Bowls Lagos Country Club. Two all-weather Greengauge greens offering up to 14 Rinks. Where: R. Marina Lt. 20, 8600-780 - Lagos. Tel: (+351) 282 770 210. Where: Orada, 8200-371 - Albufeira. Tel: (+351) 289 510 180. Where: Pcta. Fortaleza Praia Rocha, 8500-000 - Portimao. A truly unique way of sightseeing. A couple of smart, comfortable Honda Gold Wing motorbikes with sidecars operate out of Lagos, by the Marina ( just over the foot bridge ). Professional drivers. 1, 2 and 3 hour tours to Bravura, Sagres or Monchique. Tel: (+351) 914 307 907. MicroLight A British MicroLight training school, adjacent to Lagos and 1km from Meia Praia beach. Two 18 hole courses in a 'roman' setting. Miniature golf for children. Fountains, lakes and gardens for walking. Roman styled club house. Where: Located right in the centre of Vilamoura and only five minutes walk from the Marina. Caixa Postal 927, 8125 - Vilamoura. Tel: (+351) 289 300 800. Fax: (+351) 289 380 716. Distance: 21 km, Terrain: tarmac / dirt track, Duration: 3-4 hours, Difficulty: average. Adults: €40. Children (to 15): €27, including equipment, transport, picnic, water and insurance. Exhibits include Neolithic artefacts, Roman mosaics found at Boca do Rio near Budens, fragments of statuary and columns, and other remains from excavations along the Algarve. Replicas of the fret-cut chimneys of the Algarve, three-dimensional cork carvings, 16th-century vestments, ceramics, 17th-century embroidery, ecclesiastical sculpture. An art gallery, weapons, minerals, and a coin collection. Hours: Tues - Sun 09.30 - 12.00 and 14.00 - 17.00. Closed holidays. Cost: Adults: €2 , Children (11-14): €1. Where: Rua General Alberto Carlos Silveira - Lagos. Tel: (+351) 282 762 301. Where: Monte Lemos - Apt 138, Praia da Luz, 8600 Lagos. Tel: Miguel mobile: (+351) 919 498 280. Paulo mobile: (+351) 919 760 773. Sailing * O Cavalo Marinho. Where: Vila Susana - Caliços, 8365 - 000 - Armação de Pêra, Silves. Tel (Mobile): (+351) 262 577 464. Fax: (+351) 282 357 847. Various trips out of Lagos marina. Open: 1st March to 30 November. Prices below are for 2006 / 7. There are bound to be some increase for 2007 / 8. ● Grotto trips - Duration: 2 hours - 10:00, 12:00, 15.00, 17.00. ● BBQ trips - Duration: 5 hours - 10:00, 14:00. Where: Shop No. 10, next to the Pizza Hut. Lagos Marina. Tel: (+351) 282 764 670. Fax: (+351) 917 810 761. Note: Another Captain / Boat contact in Lagos. Various trips out of Villamoura marina. Champagne cruises. Charter hire. ● Private Charter: (2-8 hours) - €275 per hour. All Inclusive. Where: Q5, Marina de Vilamoura, 8125-409 - Quarteira. Tel Mobile: (+351) 965 656 675. The Algarve offers snorkelers and scuba divers excellent opportunities along the coast, especially in areas where the cliffs are high and the beaches rocky: Armacao de Pera and also from Praia da Luz to Sagres. Equipment and instructions are available at Alvor, Luz Bay Club (Praia da Luz) and Lagos. Also web search for Lagos-Sub, the local diving school. Lagos has a good diving school and gear rental information here. Snorkelling and Scuba Diving Escola de Mergulho Scubado. Where: Apartado 28 - Porto da Baleeira, 8650 - 889 Sagres, Vila do Bispo. Tel: (+351) 282 624 594. Fax: (+351) 282 624 594. Snorkelling and Scuba Diving Blue Ocean Divers. Where: Estrada de Porto de Mós, Motel Ancora - Apartado 789, 8600 - 909 , Lagos. Tel (Mobile): (+351) 964 665 667. Fax: (+351) 282 767 244. Sports Centre Offers 3 tennis courts, swimming pool, well-equipped gym, two squash courts, table tennis, bar and restaurant. There are children's football and tennis coaching sessions. There is also 18 piece circuit training Monday to Friday. Chalet-style accommodation available. Tel: (+351) 282 697 350. Praia da Luz - The club offers tennis, squash, sauna and a Turkish bath at reasonable rates (£7 for an adult for use of most facilities in peak season and £4 for a child). Where: Rua do Jardim, 8600-565 Praia da Luz. Tel: (+351) 282 789 640. Tel: (+351) 282 760964. Fax: (+351) 282 767 288. Surfing * * Torpedo Diving. Where: Aldeia do Mar - Apartado 931, 8125 - 000 - Vilamoura, Loulé. Tel: (+351) 289 314 098. Open: from 09.00 to 23.00 (peak season). Where: Access from the ground floor of the Commercial Centre through a small doorway marked Pescine (opposite the entrance to Boozey Soozeys bar). Praia da Luz. Tenpin Bowling * American-style bowling alley. Where: A bit of a drive to Praia da Rocha. Located just off the sea front near the Hotel Jupiter. Tel: (+351) 282 483 812. Walking There is a cliff top walk from Luz to Burgau. The return walk takes about 3 hours. Until I have more information try this link for more details. Walking tours Julie Statham organises walking tours covering many areas in the western Algarve. They are always at a gentle pace and suitable for all levels of fitness. Tel: (+351) 282 698 676 or (+351) 965 753 033. Opened in 1986. One of the biggest and the best in Europe (6.5 hectares).It has two self-service-restaurants, pizzerias, an ice cream-parlour and several kiosks. 25,000 square meters of lawn, a 1,500 square meter pool for children, a 1,600 square meter main swimming pool. Coach collection from Lagos and Praia da Luz (must be pre-booked, the booking agency on the promenade can do this for you). Season: March to October. Open 10.00 to 17.00 (low season) 18.00 (high season). Where: Access from the N125 or junction 6 on the A22. 7km east of Portimao. The biggest Water Park in Portugal. A Family day out. Wave Pool, Flying Carpets, Raging Rapids, Kamikaze etc. Open: from 2nd May to 23rd September 2006. Open daily from 10.00 to 18.00. Where: On the N125 just past Portimao. Signed and visible from the main road. About 45 minutes from Luz. 10km west of Albufeira. Apartado 11, 8365-908 - Alcantarilha. Where: Montechoro Park, near Albufeira. Water-Skiing Usually only available in peak season water-skiing can be found at the beaches of Vale do Lobo, Vilamoura, Praia d'Oura, Albufeira, Armacao de Pera, Alvor, Praia da Rocha and (Ocean Club) Praia da Luz. Windsurfing Windsurfing is very popular along the coast. Experienced windsurfers can rent a rig and newcomers can sign up for tuition at most of the beaches along the Algarve including Quinta do Lago, Vale do Lobo, Vilamoura, Albufeira and (Ocean Club) Praia da Luz. Charter, Days out, Exploration, Tuition. Irish owned. Offices above Do Cais restaurant (centre of the marina). Tel: (+351) 282 792 681. Fax: (+351) 282 792 682. Mobile: (+351) 919 231 962. A great little zoo. Bars / Restaurants. Mini Golf. Petting zoo. Approx Euros 17 (adult), Euros 10 (5 to 12 years), Free (under 5). Tel: (+351) 282 574 134. Fax: (+351) 282 574 898. ZOO Lagos With more than 300 animals from 150 species (2004) such as wallabies, monkeys, lemurs and exotic birds, all kept in good conditions. A natural and extensive habitat in the village of Barão de S. João, in the Algarve mountains. Open daily from 10am. Approx €8. Where: Quinta das Figueiras, Sítio do Medronhal - Barão de S. João. 8600 - 013 - Lagos. Tel: (+351) 282 680 100. Fax: (+351) 282 680 109. Amusement Park. Swimming pools for both adults and children and a few shops and restaurants. Has an interactive Dolphin program (€130). Transport: On Tuesdays and Thursdays, between May and October, a bus leaves Espiche at 08.40 hours calling at 3 stops in Praia da Luz and many places in Lagos arriving at Zoomarine at 10.30 hours, and returning at 17.30 hours. Where: 40 kilometres ( 25 miles ) from Luz.